Who says you can't mix up design aesthetics in your bathroom space? Of course, there are certain "rules" to abide by when redoing a room, but making it your own means implementing styles that reflect what you adore. So if you like something old and something new, there's always a middle ground that you can incorporate in creating a bathroom that's all you. 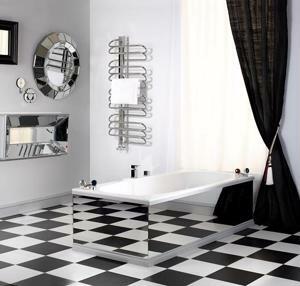 For an eclectic look, why not choose contemporary bathroom fixtures and mix it up with pieces of traditional furniture? An antique bathroom vanity, for example, can be upgraded simply by installing a more contemporary bathroom faucet. Additionally, having a state-of-the-art steam shower doesn't mean that your bathroom has to look like the cockpit of a spaceship - add on traditional pieces of furniture like a medicine cabinet made of wood or a cool chair if you feel like lounging in your spa-like bathroom. Of course, everything depends on how far you are willing to mix and match with your design aesthetics. Don't be shy about asking a friend or a family member about certain aspects of your design either - another set of eyes will be able to observe things that you may have overlooked.